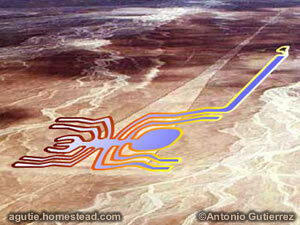 The Nazca Lines, are a set of zoomorphic, phytomorphic and geometric figures (straight lines, triangles, spirals, a bird, a spider, a monkey, flowers) that appear engraved in the surface of the desert plateaus. Nazca Spider is particularly fascinating. It matches a real spider inserted in a network of straight lines. It measures some 150 feet in length formed by one continuous line. What is remarkable about this drawing is that it is a member of a spider genus known as Ricinulei which is found only living beyond the reach of sunlight in the Amazon rainforest.